Analysis of in vivo–transduced CD46+/+/Hbbth-3 mice that did not receive O6BG/BCNU treatment. (A) Percentage of human γ-globin in peripheral RBCs measured by flow cytometry. The experiment was performed 3 times, indicated by different symbol shapes. (B) γ-Globin expression in erythroid (Ter119+) and nonerythroid (Ter119–) blood cells. ***P ≤ 0.00003 by 1-way ANOVA test. 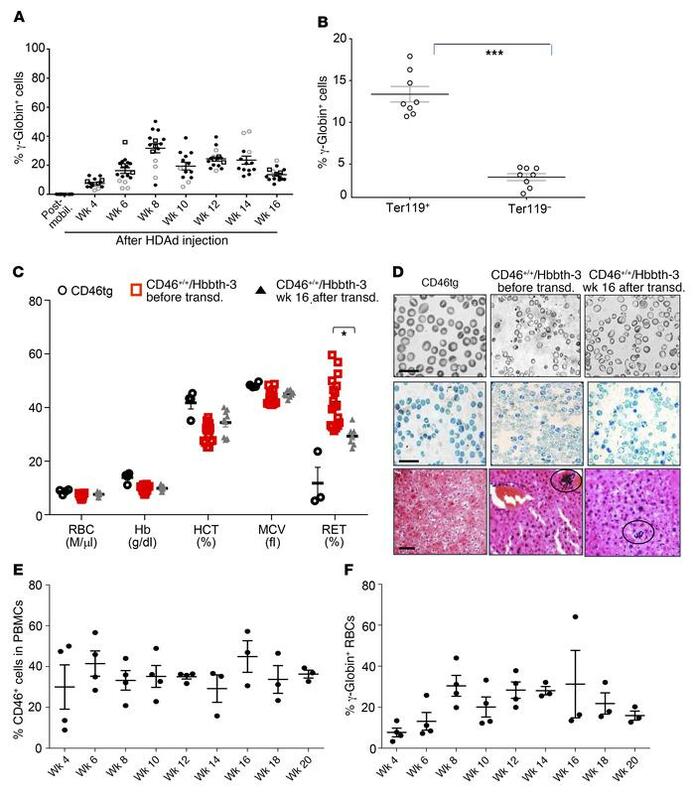 (C) RBC analysis of healthy (CD46tg) mice (n = 3), CD46+/+/Hbbth-3 mice prior to mobilization and in vivo transduction (n = 14), and CD46+/+/Hbbth-3 mice that underwent in vivo transduction and were analyzed at week 16 (n = 8). *P ≤ 0.05. Statistical analysis was performed using 2-way ANOVA. (D) Histological phenotype. Top: Blood smears. Middle: Supravital stain of peripheral blood smears with Brilliant cresyl blue for reticulocyte detection. The percentages of positively stained reticulocytes in representative smears were: for CD46tg, 8% ± 0.8%; for CD46+/+/Hbbth-3 before transduction, 39% ± 1.3%; and for CD46+/+/Hbbth-3 week 16 after transduction, 26% ± 0.45%. Bottom: Extramedullary hemopoiesis. Scale bars: 20 μm. (E and F) Analysis of secondary recipients. Total bone marrow from week 16 in vivo–transduced mice was transplanted into C57BL/6 mice that received sublethal busulfan preconditioning. Mice received immunosuppression during the period of observation. (E) Engraftment based on the percentage of human CD46+ (hCD46+) PBMCs. (C57BL/6 recipients do not express hCD46.) (F) Percentage of human γ-globin+ RBCs. Each symbol represents an individual animal.